Yep, the crayon tutorial. 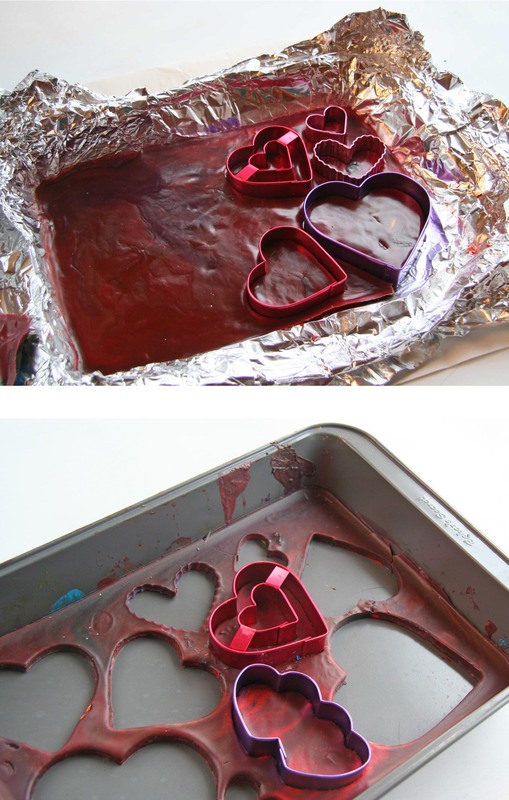 Yep, it’s been done before, but I want to do it a little bit different… Kinda like a sheet cake, I mean crayon, and cookie cutters. Note about the ‘Optional’ aluminum foil method- I was doing it this way with the aluminum foil, but then realized I like the way without foil better. You get a smoother finished underside without foil, but it means giving up the pan to the crayons… You decide! 🙂 So some pics are showing the ‘optional’ way…. Step 1- Preheat oven to 200 degrees. 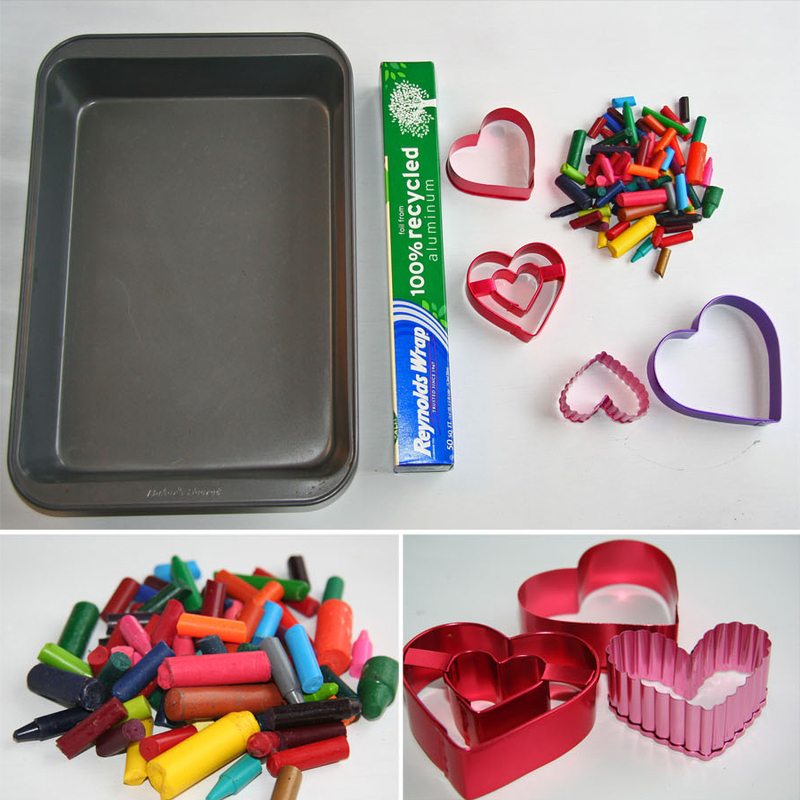 Step 2- Fill the pan with the peeled crayons. 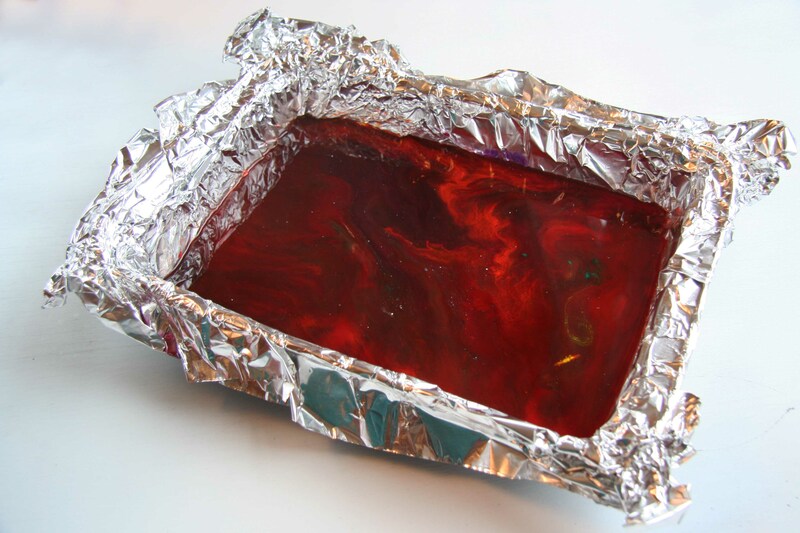 Optional Method- Line baking pan with aluminum foil. 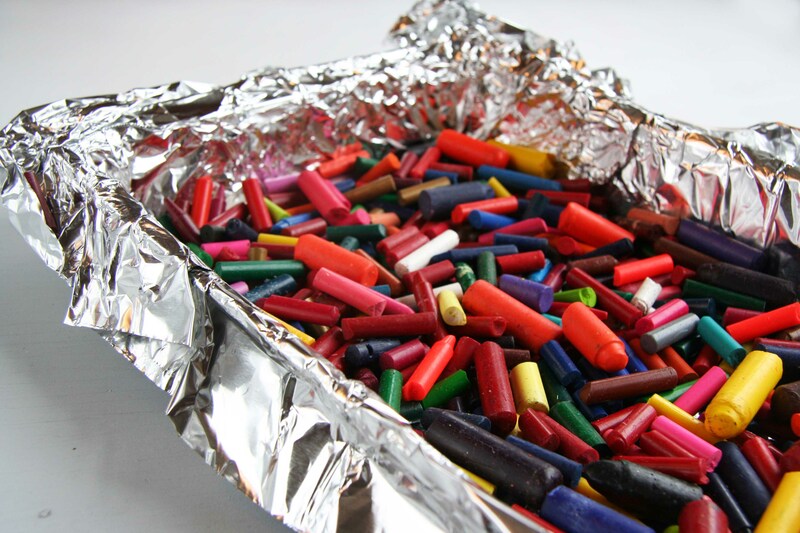 Use the large size foil so that you don’t have to overlap (My first batch I tore the aluminum foil and then overlapped… If you want to keep the pan for baking, this is not a good idea…) and then fill the pan with the peeled crayons. Step 3-Cook the crayons for about 15 minutes. Step 4- Let the wax cool for about 20 minutes. You don’t want it too warm that it’s still gooey, but you don’t want it too cool so that you can’t cut the wax with the cookie cutters. Step 5- Use the cookie cutter to cut out the shapes. Step 6- Let it continue to cool before separating. I put mine in the freezer for a while and then they just pop right out! 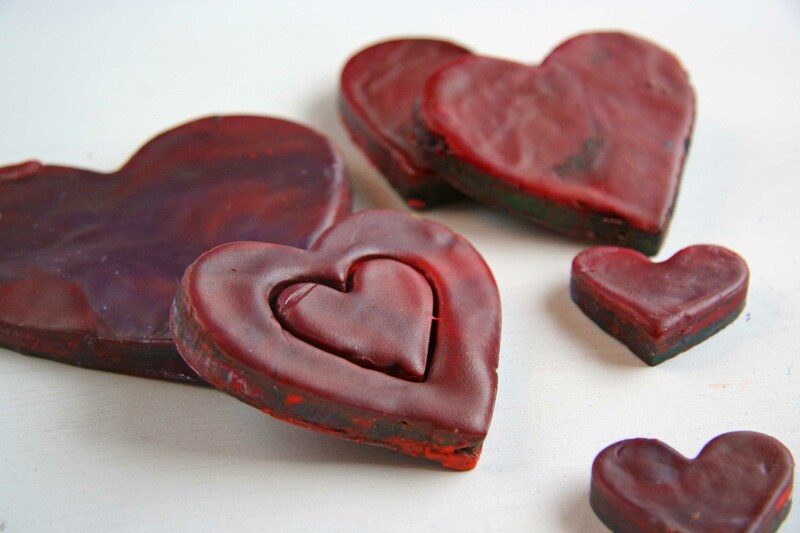 Step 7- Slide them in the Valentine envelopes, give and enjoy! This looks fun and easy! Can’t wait until Maci is old enough to enjoy crayons. Did you use all of those colors mixed together to make a red heart? If so, what color comes out when they are used? Just curious…. Yes, I just threw all the colors in for my first batch. the wierd thing, they ended up red on top (which was perfeect) and all sorts of colors on the bottom. 🙂 The second batch I used some left overs from the first batch, but mostly red, pink and orange crayons. They came out a little bit more red on top, but not by much. So sweet and such a fun project. 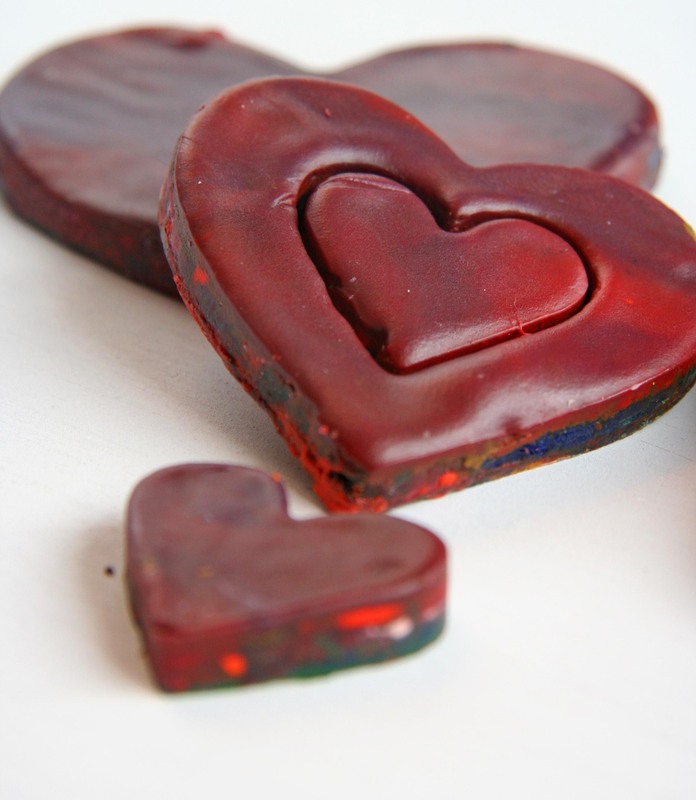 PS Thanks for letting me know you used my recipe and for all your lovely comments! How many does this make generally? Oh, my! I have no idea! It all depends on how many crayons you use and the size of the cookie cutters. And it was a couple of years ago that I made them, and honestly, don’t remember how much I used!